It's that time of year! This week I stuffed myself silly with good food at a table surrounded with sweet family and friends, and now the house is alive with twinkly lights and Christmas music! This holiday season has always been my favorite, and I find myself wishing for it for most of the year, then once it arrives it disappears in a flash! This year I'm determined to savor this season by celebrating advent with great intention! 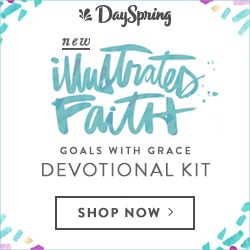 Luckily the new Illustrated Faith 'Tis the Season Devotional Kit is the perfect fit! This kit released a week ago and I could not wait to get my hands on it! There's something special about the advent -the joyfully expectant waiting time- leading up to Christmas, and I cannot think of a better way to dig into that joyful anticipation than by digging into the Word creatively with this kit. 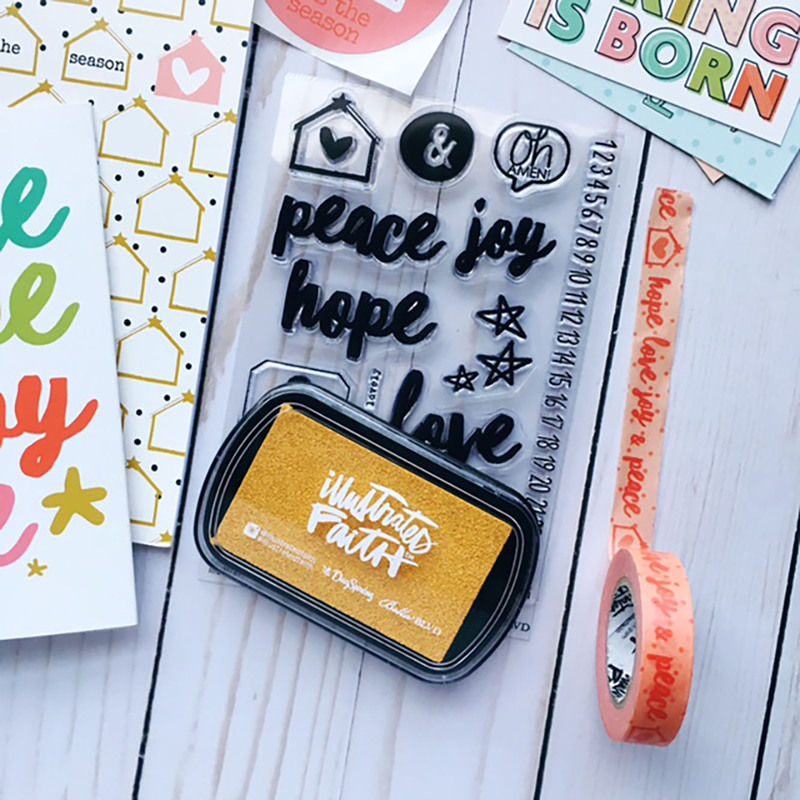 The colors are so festive, the heart behind it so pure, and the stamps a fast favorite! I don't do a whole lot of Black Friday shopping (in fact, I've worked Black Friday the past two years! ), but this deal is too good to pass up, y'all. You can get the 'Tis the Season Devotional Kit for 30% OFF with the code FRIDAY16 through November, 27! Not just the kit though, but the entire site! It's the perfect time to stock up on gifts for the whole family at a great discount. Trust me ;) I plan to do the same! Now for a closer look at the kit. 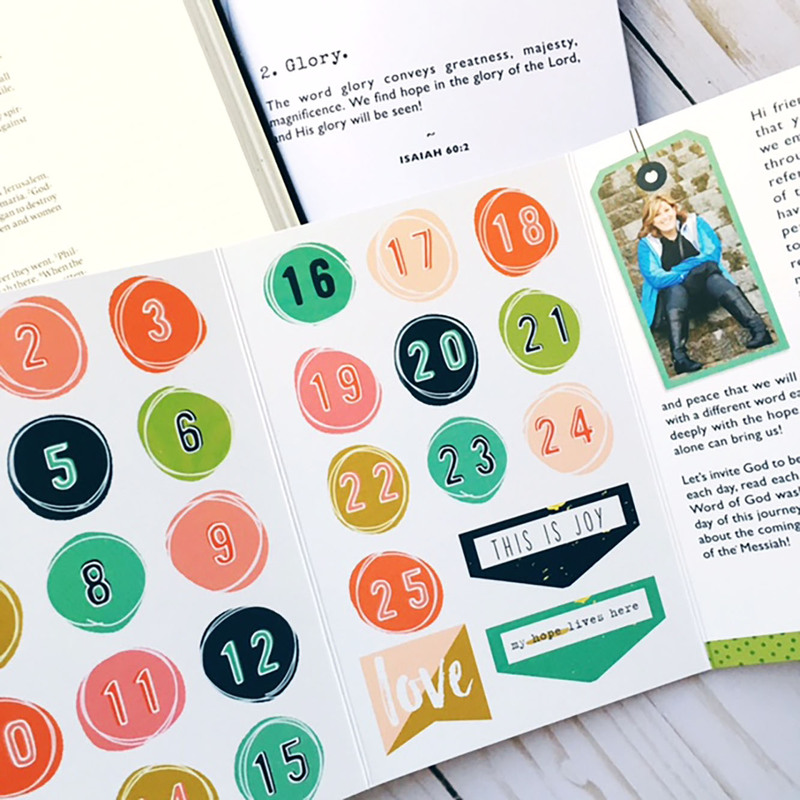 Each kit comes with a devotional (pictured above) that fits perfectly into the Illustrated Faith Travelers Notebooks. This one has plenty of white space for crafting and journaling, but some sweet snippets to guide you along the way. The stamp backer pictured above reads "Peace Hope Joy Love" on the outside and those same sentiments are pictured on the stamp beside it! I personally love the little house (stable?!) with the heart on the inside. One of the smallest inserts in the kit is the round sticker with the kit name. I love collecting those on the back cover of my Bible so I can remember which kits I've worked through during the year. This one has already found its home! I say it every time but DO NOT FORGET THE STAMP BACKER! This time it is home to 25 adorable numbers perfect for counting down until Christmas Day! They're intentionally not perfectly circular, but I still managed to punch them out with my 1" punch. The colors are so festive and fit well with the rest of the kit, and I hope to put them to good use. Look at that washi and that stamp set! Those stars are wonderfully whimsical, and I love the line of dates. Perfect for stamping along the side or the bottom of your journaling Bible page and circling the date of the entry. I also get the feeling that the "Oh AMEN!" stamp will be used for many months to come! Over all I think they knocked it out of the park once again with this kit! Hurry and grab your own HERE before they're gone, AND don't forget to use the code FRIDAY16 for 30% off the entire store through Sunday night! Celebrating Advent with Illustrated Faith and me?! Get your 'Tis the Season Devotional today! This November there's no rest for the weary. Wedding season kicked off last Wednesday when I boarded a plane for Las Vegas to celebrate one of my college best friend's marrying the love of her life! We decorated and danced the day away on Saturday, and now they're happily married! But the party doesn't stop there. A few weeks later I'll have Thanksgiving, my sister's Bachelorette party, a jaunt up to Kansas to visit a friend, and then a theatre convention with my students to close the month out. I love traveling, and I love traveling with my journaling Bible. But recent events have left me with quite a bit of back pain, so packing my actual Bible was not on my packing list for the month. 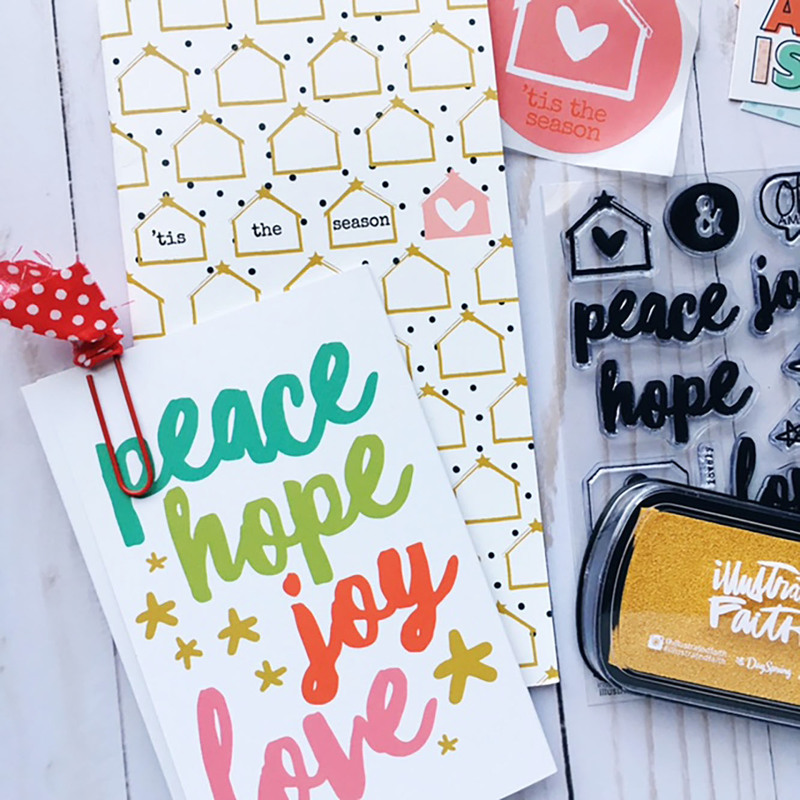 There are great online resources that I enjoy using as an alternative, AND there are some great new products from Illustrated Faith that are both lightweight and gorgeous! I grabbed my favorites, packed them in my purse for the journey, and today I'm sharing you what made the cut! Most importantly, this month is Gratitude Documented! Last year I loved filling out my "Wow, God!" journal and the different topics, each page a blank slate for creative reflection as we list the things we're thankful for this month. The 2016 Gratitude Documented Devotional Kit did not disappoint! Designed by the sweet Jess Robyn, her unique handwriting and precious illustrations were the perfect fit for a fall-inspired gratitude journal. Every kit comes with a specially designed stamp set, but what I love almost as much as the stamp sets are the stamp BACKERS! It looks white when you first open the kit, but when you unpackaged the stamp there is a trifold made of cardstock that is brimming with goodies! Particularly this time there are tabs and flags and Jess's sweet bio page. One side is even a coloring page similar to the cover of your devotional journal! Pictured above are the core pieces of the kit: The Gratitude Documented Journal, stamp set, gray ink pad, and washi tape, plus a precision pen (sold separately but I NEVER leave the house without one!). What I love about this stamp set is that the stamps can be used for SO many different pages, verses, devotionals, you name it in months to come! The gray ink is also a fun addition to my collection. I think it could be great to use as a stencil or to pre-stamp whatever the image is in a lighter color so you know exactly where to stamp over it in black or trace it in pen. I love the title of this kit, too. Cultivate a thankful heart. The word cultivate has come up so often lately, in various areas of my life, and I love the image it paints: hands in the dirt, tilling the ground, planting with care, the promise of something beautiful blooming in the future. Taking the time to plant thankfulness in our hearts can change everything! It WILL change everything! I absolutely believe it! Plus, that little acorn with the heart in it is just adorable. That is going to go EVERYWHERE in my journal! There's a second traveler's journal available through Illustrated Faith, and it's a bright canvas with fun illustrations. However I loved the tan color of the leather option, and it seems very fitting for the fall season. I waned to give you one final glimpse and tip for the Gratitude Document journal, particular about decorating the cover! I used my Faber Castell markers to trace the designs printed on the front flap. The cover is slightly shiny so in some places the ink did not want to stick and bubbled a little, but I just let it dry an extra long time before touching the design. You can see the difference in the smooth swipes of the marker at the top of the journal versus at the bottom. I actually kinda like the look! There are plenty of other ways to decorate, including using the spiffy Illustrated Faith acrylic paints, and I love that they gave us the option of customizing it this time! Since I'm traveling with this journal and not with my Bible, I tried to keep my supplies simple, just using what came in the kit, paired with the Faber-Castell pens I used on the cover to try to maintain a color scheme. I grabbed my favorite black ink, acrylic stamp block, and the glue roller that I use every day in case there was anything extra I wanted to add into the devotional as I go. 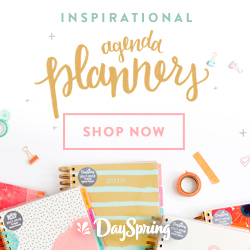 Don't forget to use the code FAMILY at DaySpring for 25% off your purchase and IFSHIPSFREE for free shipping! It's a steal of a deal I definitely plan to use before the month is up! Y'all, there are a lot of ways and a lot of reasons I love Magnolia Market, Chip and Joanna, and Waco in general. I shared our Part 1 of mine and Rachel's Silobration celebration a few weeks ago, and I finally have time to put together part two! I used to think a trip to Waco meant wandering campus, visiting my old stomping grounds at Baylor Theatre, then getting coffee with a few friends. Now I can't escape the place without hitting up the market and all it has to offer. Every time I go through, there's even more! It's insane. Let's back track to the vendor market. I mentioned the mural they let everyone paint previously, but there were also pumpkins! Hello fall! The Magnolia paint line is heavenly, and I look forward to the day when I own my own house and can paint all the things in these gorgeous colors! I also took an obnoxious amount of "from where I stand pictures" so... you'll be seeing those for a while. There were lots of fun food trucks around the lawn, including some Waco favorites. Perfect for dinner time. Common Grounds was the hip coffee shop hang-out when I was in college college, and they had a line for days! There was also the wonderful Co-Town Crepes and Heritage Ice Cream, plus a handful more I can't remember. We went with wood-fired pizza to enjoy on the lawn while we waited for the event to really begin. To win the motorcycle, the contestants drawn from a raffle had to compete in both a trivia contest and an eating contest. It was not a pretty sight! But one guy walked away --or should I say, rode away-- with a shiny new bike. And then.. the moment Rachel had been waiting for all night. Johnnyswim! I had heard of them before, and maybe one or two of their songs, but I had no idea how lovely they would be! The lyrics are incredible, their voices divine, and their hearts so tender, you can just tell. We watched up close for a while, then we wandered. Texas gave us the gift of a crisp fall evening, complete with a breeze. It was such a delight and a nice change from the sweltering heat. After meandering through yet another pumpkin patch, we lingered near these giant porch swings and snagged a seat as soon as a family got up to leave. The moment was something no Instagram square could capture. We both said it, and we both felt it. This year has been a doozy (and by doozy, I mean kind of a jerk in a lot of ways) so the night was a God wink and a place to breathe in the midst of it all. Swinging at the silos to the sound of Johnnyswim? It doesn't get much better than that. Suddenly, we heard our names! Looking up, a precious Silo employee was walking over and waving, and it was none other than Grace Dalton! Oh my stars! We were so surprised and so delighted that we both hopped up to hug her! The women across from us laughed as we squealed out loud and gushed about what a small world it really was! Grace is such a gem and meeting her in person made the night even sweeter. Before we left, I had one last request: tortilla tossing. I really don't know where, why, or how this tradition started, but it's a classic at Baylor. There's this huge suspension bridge over the Brazos River where students go at night, loaded up with bags of tortillas to toss from the bridge onto these concrete pillars out in the water. Superstition/tradition is that if you land a tortilla on the column then you're sure to get married. Well, I'd definitely done a few for good measure back when I was in school, but that night I had NO luck. My first toss, recorded on Rachel's Instagram story, embarrassingly boomeranged back onto the bridge! I almost fell over laughing! So much for that! But we tossed 40+ tortillas, giving it our best shot, then we made room for the college kids who were there to do it, too. Pro tip: slightly old/stale tortillas work best ;) Fresh ones are too flimsy. We got back on the road and bounced from playlist to playlist on the ride back, and every minute was absolutely marvelous! You can bet your biscuits I'm going to try to go back next year. Will I see you there?! It's time for another month of goals, this time that includes gearing up for two weddings and the holiday season. October was rough. R-O-U-G-H rough. Good in ways, too, but this last week has done me in, so I can't say I'm sorry to see it go. November has some great potential, and I can't wait to see what happens this month. Let's do this, y'all! "For the Lord comforts Zion; he comforts all her waste places and makes her wilderness like Eden, her desert like the garden of the Lord; joy and gladness will be found in her, thanksgiving and the voice of song." 1. Go to Silobration with Rachel! This was AMAZING. I was so glad to get some quality girl time with Rach, complete with a trip to Waco for the Magnolia Market Silobration and Johnnyswim concert. It was a blast! 2. Survive These Shining Lives. Survive is the right word, let me tell ya. But my kids made it happen. I'm SO proud of the show we ended up with! 3. Host my sister's wedding shower. Check, check, check! Lots of friends and family flooded into my parents' home to shower the bride-to-be with gifts! Now onto the Bachelorette party! 4. Powersheets Goal Refresh. BOOM! Done and ready to go! The goal refresh definitely helped when it came time to set November's goals. 5. Have a Sabbath weekend. This weekend... was something. Saturday was restful though, complete with a massage to help break up some of the tension I've been carrying in my shoulders since the start of grad school. 6. Finish the 5+ books I've started. Womp. I'm halfway through Present Over Perfect and Uninvited. I did finish I Don't Wait Anymore and it was excellent. All my single ladies, it better be your next read! 7. Set a post-show school routine. I'm working on it, so it's in progress. A few changes to be made, but there is more work to be done. 8. Ketogenic eating + yoga. Ha. Haha. Ha. The yoga thing is going at least! Holy yoga Monday's after school have been great. 9. Continue with my prayer & praise planner. I've done a few more pages in my Illustrated Faith planner and I can't wait to see it fill up! Now to move on to this month! Only two to go until 2017, how crazy?! 1. Celebrate Hannah in Las Vegas! This weekend I'm off to Nevada for the wedding of one of my best friends from college. Hannah, Claire and I, The Three Musketeers, have not all been together since graduation, so to say I'm excited would be an understatement! 2. Participate in NaNoWriMo. I'm crazy. I'm definitely crazy. But I want to get some of this book out on paper, or at least into Microsoft Word. It's National Novel Writing Month and I've signed up to attempt (key word attempt) 50,000 words in a month. I can chug out 2,000 - 3,000 in one sitting, but daily? We shall see. I'll keep you posted. 3. Get my 2017 PowerSheets! Launch day is TODAY! I have lived by the PowerSheets for 3 years and I cannot recommend them enough! Pick up your set HERE! 4. Host my sister's Bachelorette Party. The wedding is a month and a half away and the party's still going! Her bachelorette invites are out and I can't wait to share where we go and what we do! 5. Finish decorating for Christmas. I definitely put up my Christmas tree last weekend, but now I have to get the rest of it up when I get back from my trip. 6. Finish 5+ books. Hopefully my flights this week will help me conquer a few. Up next: A Court of Thorns and Roses, Circling the Sun, Love Your Life, For the Right Reasons, and Present Over Perfect. 7. Yoga at least once a week. Mondays are about to become non-negotiable. I need the stress relief and some accountability. 8. Finish the wedding prep. I have bouquets to make, boutionerres to finish, and a few more projects to tidy up before my sister walks down the aisle in December. Time will get away from us asap! November, here we go. Let's do this. What are YOU going to make happen this month?